"Through working both as a full-time touring drummer and drum tech I see nearly every brand put to the test, and Yamaha hands down come out on top every time. Not only are they a beautifully crafted instrument but also perfectly engineered for the professional touring industry. As far as tone goes, Yamaha achieves Full Throttle Sonic Onslaught on one hand, and with a turn of the key Sweet Unpolluted Ambience. The Yamaha Subkick is such an integral part of my sound these days, they have altered my impression of what an acoustic kick drum should sound like!!!" 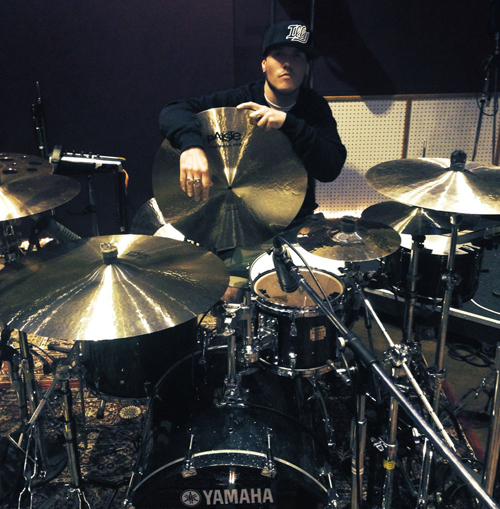 Ben started playing at the age of 12 through and quickly joined the Billy Hyde Academy under Milan Troha, He later became the events co-coordinator for Drumcraft and put together such events and clinics as the Australian Drummers weekends, Mike Mangini, Pat Torpy, Kenny Aronoff, Jimmy DeGrasso, Grant Collins and many more. Over the years Ben has enjoyed a heavy Touring schedule with bands such as MM9, Switchkicker, LO!, Kinetic Assassins, The Dead Love, Sub Atari Knives and most recently playing with Australian Rapper ILLY, covering Australia's top festivals and Venues, and has appeared on numerous session recordings and also TV commercials for MTV, Jagermeister, NRMA and even flavoured milk! Ben has taught at Drum City, School of Rock Sydney, Drum Centre Music Centre, Zen, and when off the road Ben is the Drum Dept manager at Billy Hyde Stage Systems as the head in house drum tech, getting first-hand experience of what passes as a Road worthy set of Drums and Hardware, hence the reason he plays Yamaha over all other brands.